Global breast cancer drugs market expected to generate around USD 38.3 billion by 2025, at a CAGR of around 10.55% between 2019 and 2025. The increasing breast cancer prevalence worldwide is the major driving factor for the global breast cancer drugs market along with increasing health awareness, healthcare spending, and rising disposable income of people. The report covers a forecast and an analysis for the breast cancer drugs market on a global and regional level. The study provides historical data from 2016 to 2018 along with forecast from 2019 to 2025 based on revenue (USD Billion). The study includes drivers and restraints for the breast cancer drugs market along with the impact they have on the demand over the forecast period. Additionally, the report includes the study of opportunities available in the breast cancer drugs market on a global and regional level. In order to give the users of this report a comprehensive view of the breast cancer drugs market, we have included a competitive landscape and an analysis of Porter’s Five Forces model for the market. The study encompasses a market attractiveness analysis, wherein all the segments are benchmarked based on their market size, growth rate, and general attractiveness. The report provides company market share analysis to give a broader overview of the key players in the market. In addition, the report also covers key strategic developments of the market including acquisitions & mergers, new product launch, agreements, partnerships, collaborations & joint ventures, research & development, and regional expansion of major participants involved in the market on a global and regional basis. The study provides a decisive view of the breast cancer drugs market by segmenting the market based on drug type and region. Based on drug type, the market is segmented into chemotherapy drugs, hormone therapy drugs, targeted therapy drugs, and other therapeutic drugs. Chemotherapy drugs are sub-segmented into anthracyclines, taxanes, antimetabolites, alkylating agents, and epothilones. Anthracyclines segment is split into doxorubicin and epirubicin. Taxanes are split into paclitaxel and docetaxel. Antimetabolites segment is classified into fluorouracil, capecitabine, and gemcitabine. Hormone therapy drugs are classified into selective estrogen-receptor modulators (SERMs), aromatase inhibitors, and other hormonal therapies. Selective estrogen-receptor modulators segment is further split into tamoxifen, raloxifene, and toremifene. Aromatase inhibitors segment is split into letrozole, anastrozole, and megestrol. Other hormonal therapy drugs include goserelin acetate, fulvestrant, fluoxymesterone etc. The targeted therapy drugs are classified into monoclonal antibodies (mAbs) and tyrosine kinase inhibitors. Monoclonal antibodies (mAbs) are further split into bevacizumab, trastuzumab, and other mAbs. The regional segment includes the current and forecast demand for North America, Europe, Asia Pacific, Latin America, and the Middle East and Africa with its further classification into major countries including the U.S., Canada, Germany, France, UK, China, Japan, India, and Brazil. 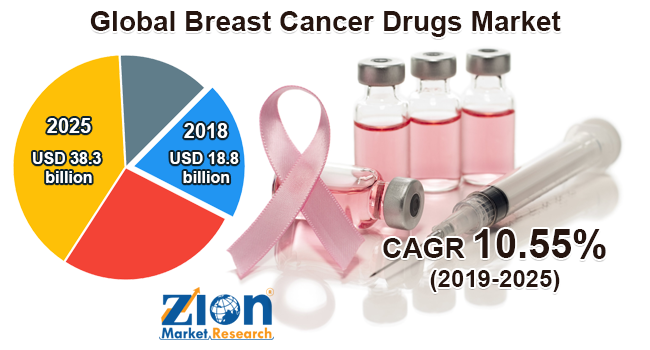 Some key players of the global breast cancer drugs market include AbbVie, Inc., Novartis AG, F. Hoffmann-La Roche Ltd., AstraZeneca, Celgene Corporation, Eli Lilly and Company, Merck & Co., Inc., Biocon, Genzyme Corporation, MacroGenics, Inc., Janssen Global Services LLC, Onyx Pharmaceuticals Inc., Celldex Therapeutics, and BioNumerik Pharmaceuticals, Inc.